Phew! It has been an exciting month for us at Pratham Books. Last month, we launched #TheBookMonsoon to mark Donate-a-Book‘s 3rd birthday. We asked if you could help us raise funds for 3000 books in 30 days. But guess what? YOU donated 3000 books in just 8 days! And you wouldn’t stop. Over 12,000 books have been donated to several campaigns during this period. 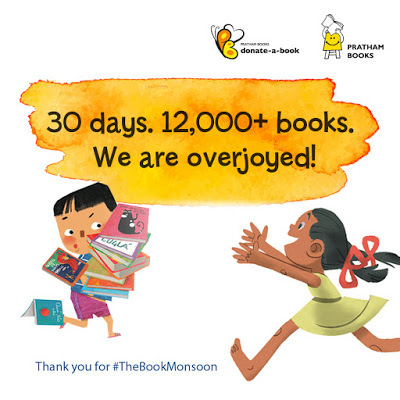 Thank you for making #TheBookMonsoon a roaring success and showering the gift of books to children across India! Umri Foundation aims to set up at least 5 reading centres in government schools in rural Karnataka. Christel House, Bangalore wants to build a library with a rich variety and diversity in their books. Help empower these 85 bright young minds from Sion, Maharashtra towards being empathetic individuals who believe in their power to rewrite their own story. Support Pratham Books’ annual One Day, One Story event by donating books that can help more storytellers share the joy of reading across India. Gaon Kalyan Samiti in Angul, Orissa want to create libraries to empower the children they work with. Thank you for helping India’s children read.